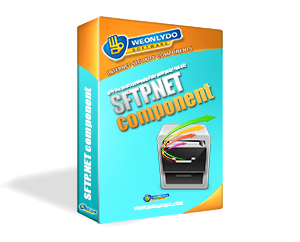 Just like our best selling product wodSFTP ActiveX, this component implements the client side of the SFTP protocol. It is written in C# and has an MS-like interface to completely integrate into your dotnet applications. It supports file uploading, downloading, deleting, directory creation.... It works in both blocking and non-blocking modes, making it suitable for use in your applications written in ASP, ASPX, VB, VB.NET, C#, etc. The SFTP for C# and VB.NET (Secure File Transfer Protocol) provides secure file transfer functionality over any reliable data stream, SSH in this case. It is the standard file transfer protocol for use with the SSH2 protocol. wodSFTP.NET is a dotnet implemenation of client side of this protocol which is reliable and easy to use. Blocking mode to execute methods and wait until they are completed. Includes free wodKeyManager component to deal with private key loading, saving, generation etc.